While trying to rescue the Starfleet ship USS Defiant, Captain Kirk disappears when the dead ship is pulled into interspace. The Enterprise is then attacked by a mysterious local race, the Tholians. "The Tholian Web" is episode #64, production #64, first broadcast on November 15, 1968, and repeated August 19, 1969. It was written by Judy Burns and Chet Richards and directed by Herb Wallerstein. 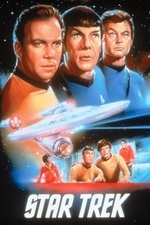 I'll post something more about this later, but this was the first Star Trek of any series I ever saw (.. and I've since gone through every series, plus a good 250+ books or so). Got a VHS from a pawn shop, and was hooked. For my money (and some of this is nostalgia), this easily the best episode of the original series. While the premise was sci-fi'y, the entire episode was an exploration of the foil between Spock and McCoy, and not another Planet of Hats. Come to think of it, I haven't watched it in a while, so will go back and do that. I'm curious to see if the effects hold up (not that they need to, just an idle comment). I LOVED the image of the Tholian in this episode, and the cool way they did the voice. I can hear it in my head as I am writing this. For my Tholian Recluse in Star Trek: Online. Stupid PWE ruining my game. But seriously, this episode was awesome. I also liked that it served as a springboard for one of the few episodes of ST: Enterprise that I well and truly loved. I loved this episode. The effects of the Tholians hold up, and the story worked. I am glad I am doing this being a ST:TNG fan. I might start that next. Definitely the best of the third season, and one of the best TOS episodes overall. The Tholians are inscrutable and the threat is real, but the episode is all about Spock and McCoy ad shows just how well Nimoy and Kelley understood the characters and their relarionship. 1960s television drama being what it was, this is about as good as any other show you might have watched in 1969. The Tholian Web Poetry Slam! Am I all right, Doctor? Have we lost the Captain? The Tholian web -- like "The Tholian Web" -- makes very little sense, but it is a beautiful and dramatic concept. I really loved the design for Loskene, too, mood-lighting, wavey distortion and all. It was a shame that they couldn't have had the puppet move just a little. BTW, I've had a look at some clips of the 'remastered' release, and it adds nothing of value. I wish they'd just leave the model shots as they were originally broadcast. What the devil? [musical stinger] . . . Jim, this ship is dissolving. My hand just passed through a man and a table! KIRK: Chekov, McCoy, prepare for transportation. You too, Spock. KIRK: I know what the chances are. Mister Spock, don't argue. Get back with the information. (Softly and more personally): I'll be right there.